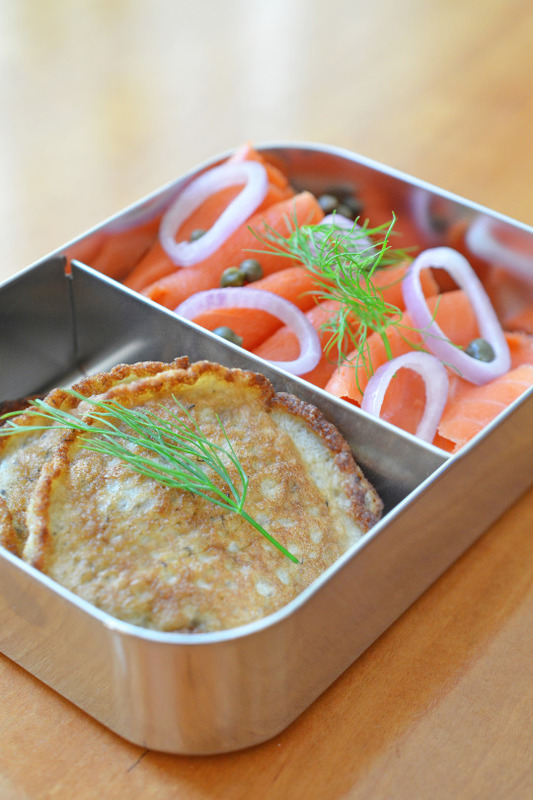 Let’s end this series of Paleo Lunchboxes with a bang…or better yet, a blini! 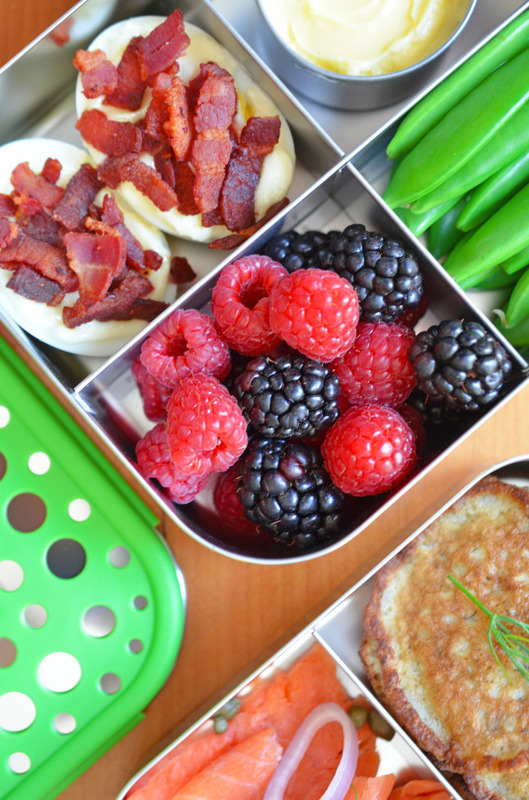 Everyone loves brunch, so why not pack it for lunch? 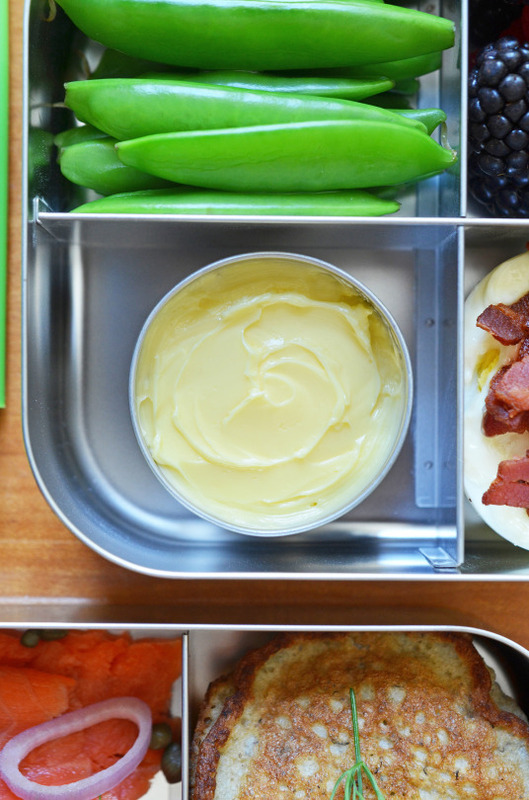 In our final installment of this year’s Paleo Lunchbox series, we brainstormed with our buddies at LunchBots about our favorite brunch items and crammed ’em all into one simple, portable, and crave-worthy meal. Alright, these blinis are nothing fancy. 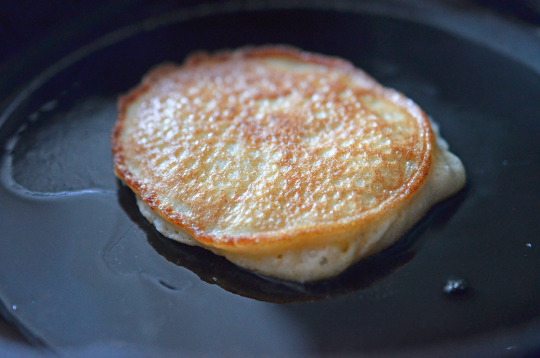 They’re simply a savory mod of my Cinnamon and Coconut Pancakes, but if you need it all spelled out, keep reading ’cause the blini recipe’s at the very end of this post. These blinis freeze well, so I make a batch and pack them straight from the freezer (they’ll defrost by lunchtime). 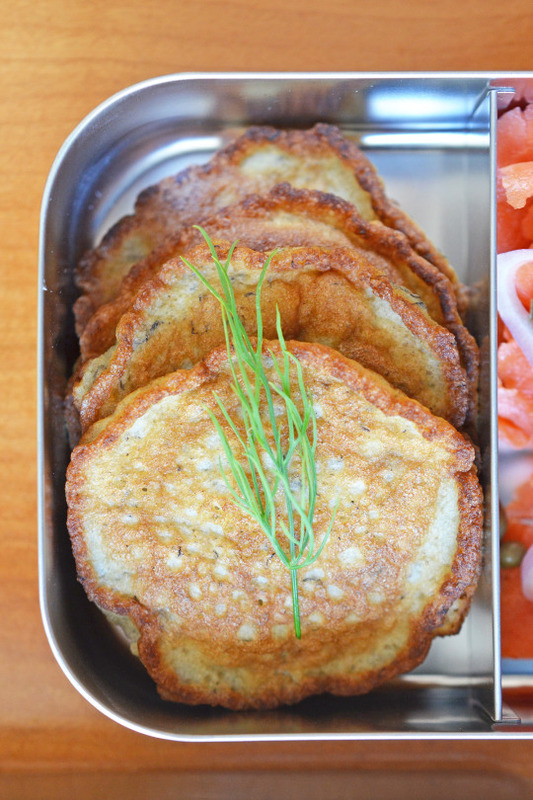 In my opinion, a blini’s naked unless it’s adorned with a couple of smoked salmon ribbons. Oddly enough, I didn’t always feel this way. As with fancy mustard and sauerkraut, I avoided smoked salmon until I tried it again in college. 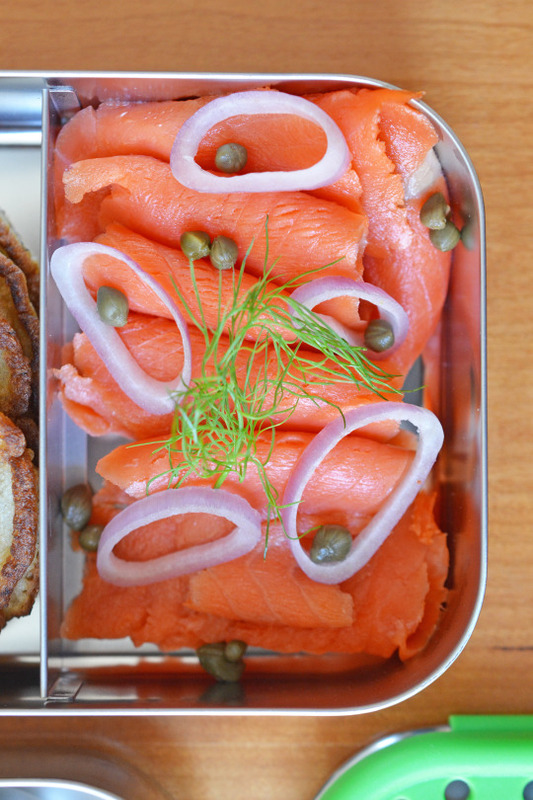 Now, I can’t get enough—especially paired with thinly sliced shallots, capers, and dill. There’s tons of smoked wild salmon available at the market, so my selection just depends on my mood. If I’m doing a Whole30, I make sure the ingredient list doesn’t include any sugar or crazy additives. 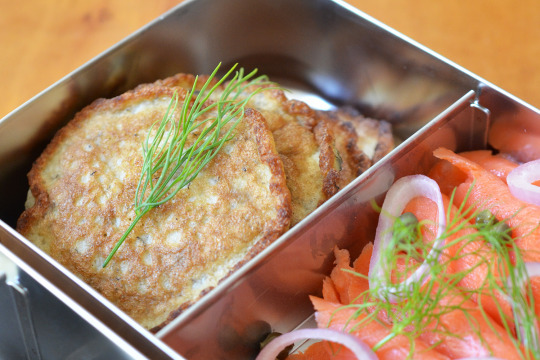 My favorite “glue” to keep the salmon attached to the blinis is a healthy smear of salted grass fed butter or ghee. Add some blanched sugar snap peas and a handful of berries, and you’re all set! Alrighty, folks! 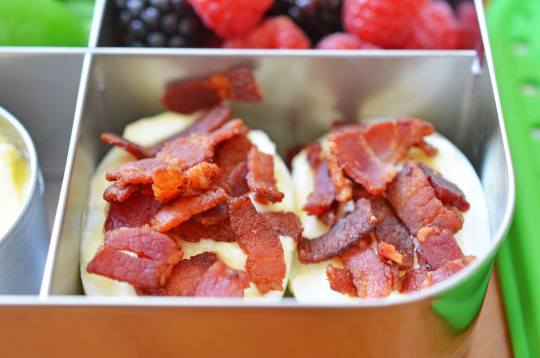 That’s it for this year’s Paleo Packed Lunchboxes with my friends at LunchBots! 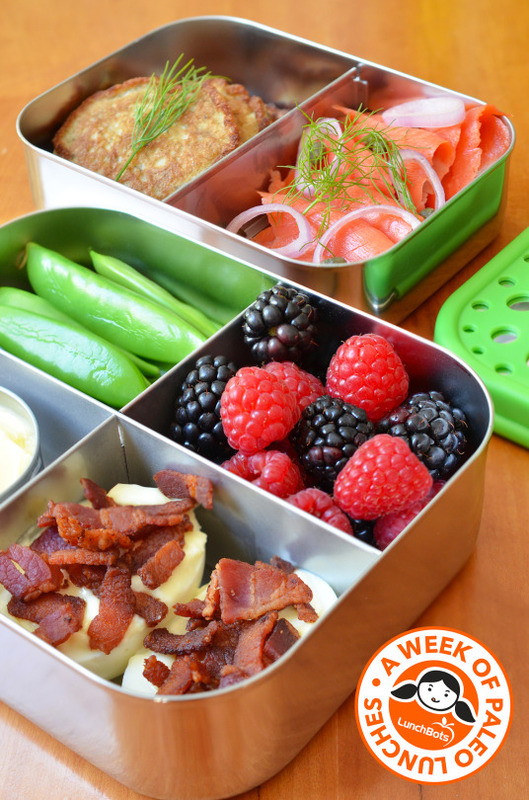 Don’t forget to refer to this epic roundup post for even more portable midday meal inspiration! Now, go forth and pack your lunches! In a medium bowl, whisk the eggs, coconut milk, mashed banana, and apple cider vinegar together until well combined. Then, in a separate bowl, mix together the dry ingredients (garlic powder, coconut flour, baking soda, and salt). Whisk together the dry and wet ingredients just before cooking. Heat a tablespoon of ghee over medium heat in a small cast iron skillet and add a tablespoon of batter to the pan. As soon as bubbles formed on the surface (about 1½ minutes), flip the blini over and let it cook for another 30 seconds or so on the other side. Continue the process, until you’re out of batter. The blinis are best eaten fresh, but you can also freeze them. I freeze the pancakes in a single layer on a baking sheet until solid, then I store them in a sealable freezer bag for a few months.